Job hunting requires some creative thinking. Whether you've been in the same job for many years or find yourself having to "transition" to a new job, making a career change can be a frightening and frustrating experience. The Department of Labors Office of Research recognizes the difficulties this kind of change can bring. We developed Connecticuts Reemployment Portal to inform and prepare you to take charge of your career. Connecticuts Reemployment Portal displays occupations with similar characteristics such as knowledge areas, tools and technology, and general work activities of your selected occupation. Career development is a lifelong, ongoing process. We hope Connecticuts Reemployment Portal connects you with helpful information as well as excellent opportunities. The Job & Career ConneCTion helps you identify occupations that may be a good match for your skills, interests, and personality, and provides you with detailed information on these occupations. It will help you find appropriate education and training opportunities and identify employers who may hire people for those occupations. It will also provide tools to help you get the job that is right for you - including help in writing a résumé, getting through the job interview, and finding day care for your children. Since 1997, the Connecticut Department of Labor has been a leading producer of job fairs in Connecticut. Whether you are an employer in need of workers to fill new or vacant positions, or an individual unemployed, underemployed, seeking a new career, or just entering the workforce, we have something special to offer you. Approximately twelve fairs are held yearly throughout the state. (TEPS) is a tool designed to aid the analysis and discussion of the demand and supply of talent in Connecticuts workforce. It is intended to help identify where there may be skill shortages or surpluses in the labor market, and thereby guide investments in education and training programs by program planners and administrators, as well as by individuals considering career options. Many Connecticut adults and young people are struggling to find good jobs because they do not have the science, technology, engineering, and math (STEM) skills employers are looking for. At the same time, Connecticuts high-tech employers need a skilled workforce ready to meet the demands of the 21st century global economy. Explore how you can get good jobs requiring various levels of science, technology, engineering and math skills. The Connecticut Department of Labor, Office of Research collects New Hire information from employers to assist the Department of Social Services in tracking down parents who owe child support. Through the National Directory of New Hires, the State of Connecticut shares with, and receives information from, other states. The new site www.ctnewhires.com, offers two easy ways for employers to report New Hires, online data entry and FTP. These two means of reporting will help find those individuals who owe child support more quickly as well as reduce the cost of finding them. Your personal guide to career decision-making. This publication was created to provide the information needed to help learners, from youth to adults, make informed decisions about their career choice and preparation. While career development is particularly important for young people, individuals of all ages need access to information and guidance on careers. New technologies, heightened global competition, and the information revolution are transforming the nature of work and careers. Individuals must have access to accurate and timely information so that they may become fully involved in their career choices. Included in the Career Table is information on the projected job openings for the near future, education and training requirements, and the earning potential for each of the occupations for your chosen field. 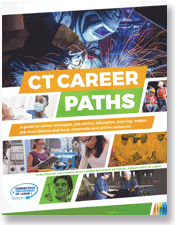 This revised edition of Connecticut Career Paths 2016 includes information on the knowledge base and fundamental skills that employers often look for in job candidates. In addition, each occupation has been assigned to one of five growth ranks, from "growing much faster than average" to "growing much slower than average" based on its ten-year (2012-22) growth rate. 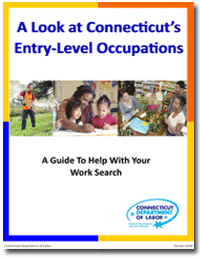 A Look at Connecticut's Entry-Level Occupations for people who want or need to find work immediately, but don’t know where to start. . This annual spring conference is jointly sponsored by the Connecticut Career Resource Network (CCRN), CT Learns (State Department of Education's School-to-Career initiative) and CT Works (Connecticut Department of Labor). The audience for this conference is career development specialists, counselors, teachers and others. Workshops usually cover such topics as workforce development, career development, employment trends and the use of labor market information in career decision-making. ATTENTION: Job Seekers, Students, Career Counselors, Teachers, Education/Training Administrators, and Workforce Professionals. Connecticut Career Posters offer colorful, at-a-glance illustrations of job journeys in each of Connecticut's 16 career clusters. Each poster includes information on some of Connecticut's in-demand occupations within each career cluster, grouped by level of education or training required and average annual wage.